There are no large coronal holes on the Earth-facing side of the sun. Credit: SDO/AIA. POSSIBLE METEORS FROM COMET HARTLEY 2: A pair of unusual fireballs over Canada and the southeastern USA have experts wondering if Comet Hartley 2 might produce a meteor shower in early November. Get the full story from Science@NASA. DEAD SPACECRAFT WALKING: Two NASA spacecraft that were supposed to be dead a year ago are instead flying to the Moon for a breakthrough mission in lunar orbit. The research they conduct could lead to important advances in space weather forecasting. For more information, read "Dead Spacecraft Walking" from Science@NASA. The bright rays and luminous bloom centered on the planet are digital artifacts. Venus is so bright, it saturates SOHO's CCD detectors, causing electrons to "bleed" across pixel boundaries. The same thing happens to a lesser degree with Mercury, which is bisected by a horizontal bar--another artifact. Note how the star Spica, dimmer than the planets, appears as a normal pinprick. It does not saturate the CCD. Venus will continue its flamboyant passage for the next few days. Join SOHO for a ringside seat. Since yesterday, the shape-shifting sunspot has developed a "beta-gamma" magnetic field that harbors energy for M-class solar flares. 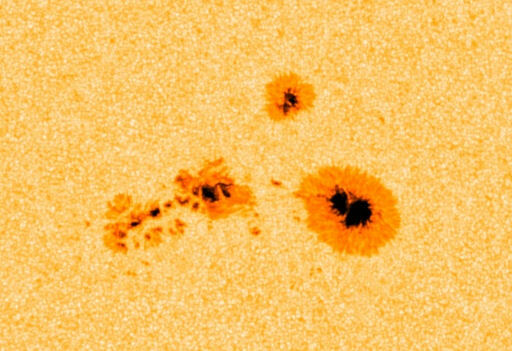 Any such eruptions will likely be geoeffective because the sunspot is almost-squarely facing Earth. Readers with solar telescopes are encouraged to monitor developments. On October 27, 2010 there were 1155 potentially hazardous asteroids.